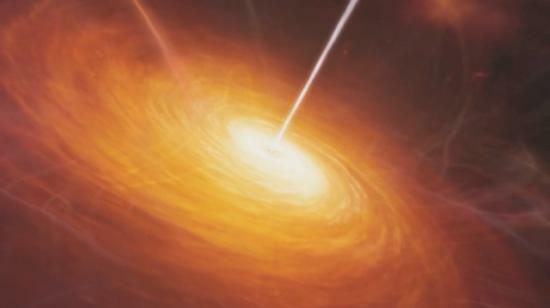 Quasars are among the most energetic things in the universe, and are intense sources of radio waves and visible light. Because of their great distance, they appeared almost point-like to early observers. 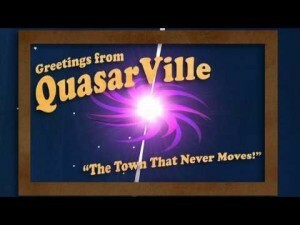 Thus they were given the name quasi-stellar radio sources, or quasars for short. For several decades the source of their great power was a mystery, but we know know that they are powered by active supermassive black holes in the centers of galaxies. As we’ve observed more quasars, we’ve found that they can vary significantly in brightness, redshift, and line spectra. But despite this variety, there are some commonalities. One big commonality is known as Eigenvector 1, which traces correlations between emission lines of iron, oxygen and hydrogen, which in turn correlates with properties such as x-ray strength and the like. Eigenvector 1 was first discovered in 1992, so we’ve long known that it works, but why it works has been a bit of a mystery. Now a new paper in Nature may shed light on that mystery. In this new work, the authors looked at two line spectra properties: the width of an emission line called hydrogen beta (Hβ) and the strength of an iron emission line known as Fe II. 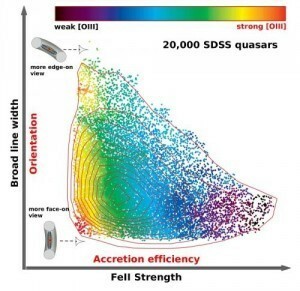 These are useful because they are known to correlate with specific properties of quasars. The broadness of Hβ is a measure of the rotational motion of the accretion disc along our line of sight. As the material of the accretion disk rotates about the black hole, one edge of the disk is moving toward us slightly, while the other edge of the disk is moving away from us slightly. This means light from one edge is slightly blueshifted, while the other edge is slightly redshifted. This is an effect called line broadening. Since the speed of material in a black hole accretion disk is fairly consistent, the broadness of Hβ is a good measure for the orientation of the accretion disk relative to our line of sight. A broad line indicates an almost edge-on view, while a narrow one means the disk is almost face-on. The Fe II line is connected to Eigenvector 1, and the strength of the Fe II line has been suspected to be a good measure of the efficiency at which the black hole accretes matter. Specifically, it seems to be a good measure for the Eddington ratio, which is the ratio of its rate of accretion to the maximum theoretical limit. So basically, these two lines are a measure of the orientation and energetic efficiency of quasars. The authors then gathered the line spectra observations of 20,000 quasars and plotted them as a function of Hβ and Fe II. What they found was that the quasars cluster within a wedge. Given this wedge shape, it seems pretty clear that Fe II is, in fact a good measure of the Eddington ratio. The peak strength of Fe II aligns well with the orientation of the accretion disk. What’s particularly striking about this graph is that it follows a similar method to that of the Hertzsprung-Russell (or HR) diagram. The HR diagram is a plot of stars by their brightness and color. When it was first developed around 1910, it revolutionized our understanding of stellar evolution by demonstrating that stars tend to cluster along a line known as the main sequence. We’ll have to wait and see if this new diagram for quasars leads to a revolution in our understanding of quasars and other active galactic nuclei, but it seems clear that this new work has a great deal of potential.